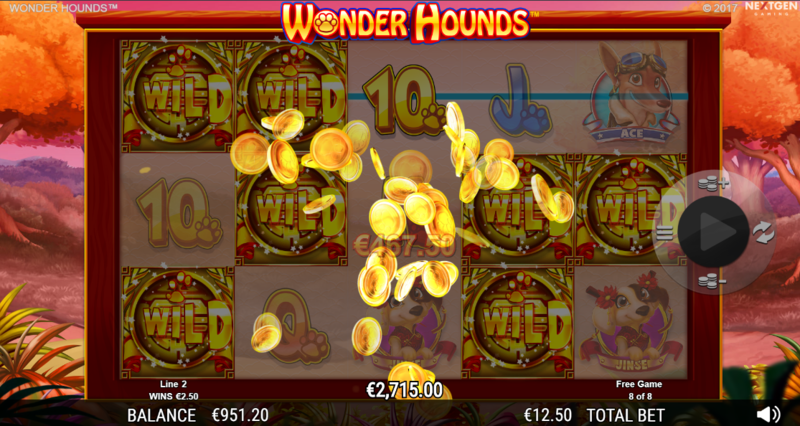 Wonder Hounds gives you three charming main characters (all well-dressed doggos) and a beautiful looking slot with some fun randomised events to play. Just a shame about the low RTP (95.16%). 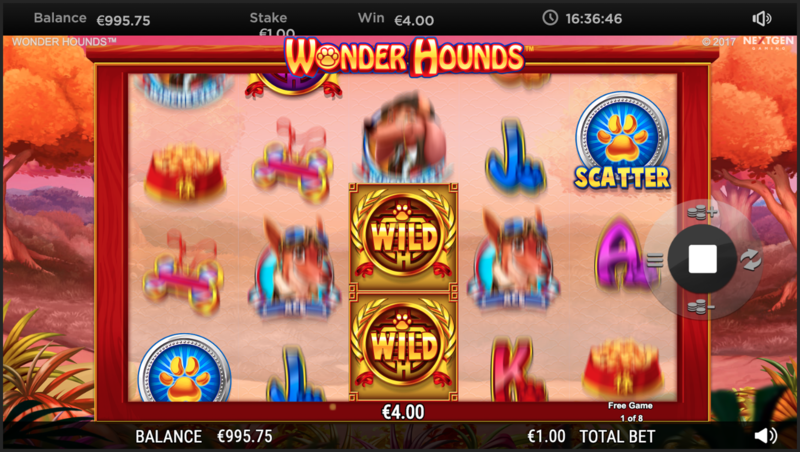 Nextgen’s Wonder Hounds slot machine is set in a world of intelligent and extremely dapper canines. The dogs you meet in this world include Ace, an old-timey fighter pilot; Winchester, a country gent in deerstalker and monocle; and Jinse the Asian concubine of one or both of them. The characters are fun and although there is very little real story, it is easy to project a classic Chicken Run style competition between the English Winchester and the American Ace. Nextgen do a good line in animations when they want to. Wonder Hounds is definitely one of the good ones with a lovely set of animations and plenty of character worked into every symbol – apart from of course the ubiquitous and slightly dull Ace to Nine symbols. The soundtrack, on the other hand, is just fairly unobnoxious, and certainly won’t be winning any awards. 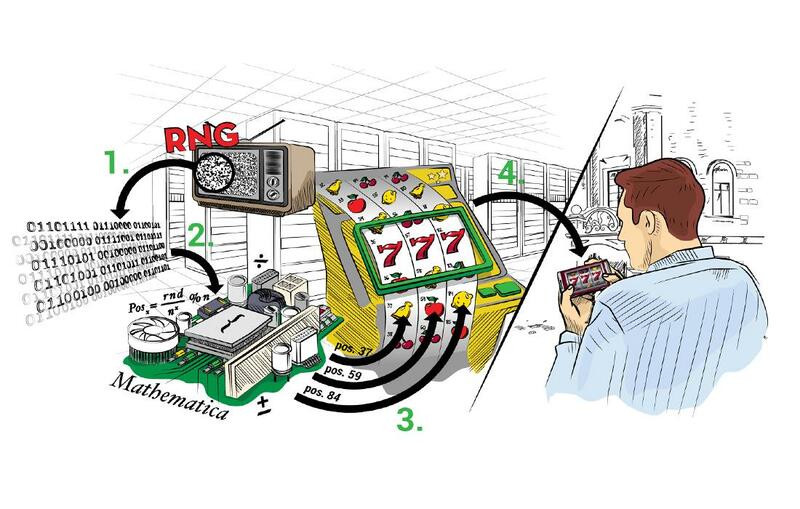 The game is a 25 win-line, five reel slot. The number of lines you can play is fixed. Overall gameplay is fun, the game has plenty of little-animated distractions to keep you interested despite its lack of complicated bonus games or gamble options. There are two special symbols: a Wild and a Scatter. The Wild substitutes for any symbol apart from the Scatter. You can also win using a Wild symbol combo if it falls on a win line. A nice twist is that at the end of every spin up to one random Wonderhound per reel may switch to a Wild symbol. If you hit three or more Scatters you win 8, 12 or 15 free spins for 3, 4 or 5 Scatters respectively. 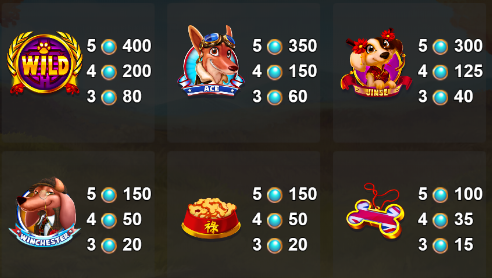 At the start of these free spins, a random number of Wilds (between 1 and 15) appear on the reels. 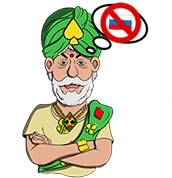 For all the free spins any Wilds that are hit lock in place for the rest of the free spins. The RTP of 95.16% is a bit disappointing, falling almost a full percentage below the industry yardstick we use of 96%. 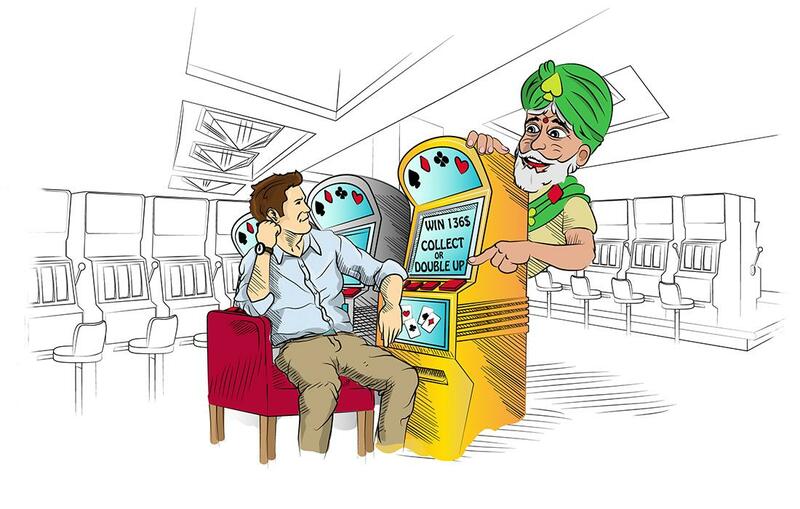 Coupled with medium to low volatility this slot machine doesn’t make a great match for our preferred strategies. The other disadvantage of this slot is the lack of ability to choose how many win lines to play. You are locked into the full 25 every spin so you are unable to manipulate volatility or bet per spins to as fine a degree as you might like. The site we tested allowed for bets per spin of €/£/$0.25 to €/£/$250. This is a very good spread and allows for most bankroll sizes to play. 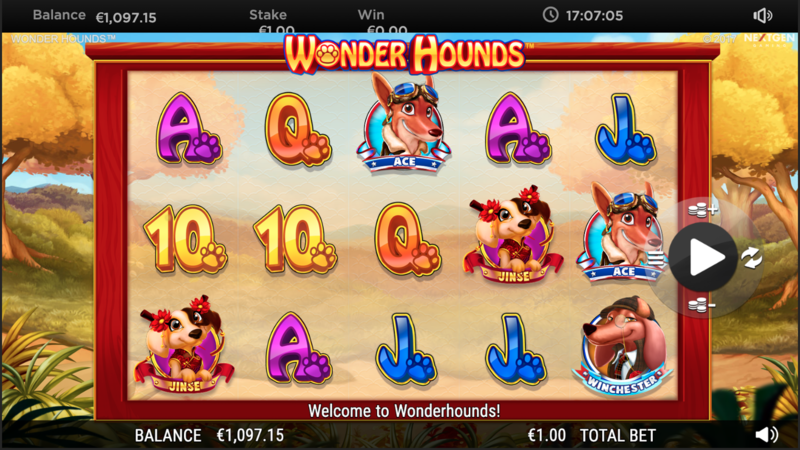 Wonder Hounds is fun to look at and fun to play. However, it lets the side down when it comes to its RTP, volatility and lack of features. It could have been a great slot, but on the whole, ends up being very hard to really recommend. Disappointing.